This study presents a first case of multiple peripheral typical carcinoid tumors associated with sclerosing hemangiomas in the lung. A 52-year-old male presented with incidentally detected multiple pulmonary nodules on a simple chest X-ray during routine health check-up. A computed tomography (CT) scan of the chest showed multiple nodular lesions in the middle and lower lobes of the right lung. These were initially suspected as inflammatory lesions due to miliary tuberculosis. However, possibility of malignancy could not be excluded and right lower lobe lobectomy was performed. Histopathologically, some nodules including two largest nodules were composed of small round to spindle shaped cells with fine chromatin pattern, whereas the rest of the sclerotic nodules were composed of two epithelial cell types- surface cells and round cells. The final diagnosis of this case was multiple peripheral typical carcinoid tumors associated with sclerosing hemangiomas of the lung. For past three years of post-surgery follow up period, no new lesions or changes in the right middle lobe have been identified. The virtual slide(s) for this article can be found here:http://www.diagnosticpathology.diagnomx.eu/vs/1511610609725790. Pulmonary sclerosing hemangioma (PSH) is an uncommon lung tumor, characterized as alveolar pneumocytoma. Since the first report in 1956 by Liebow and Hubbel, PSH has been considered to be a benign pulmonary tumor occurring predominantly in females that usually presents as peripheral solitary lesions. Despite several studies of PSH, its clinical behavior and histogenesis still remains ambiguous. However, the histologic characteristic of PSH is well known to show papillary, sclerotic, solid, and hemorrhagic patterns with two cell types. 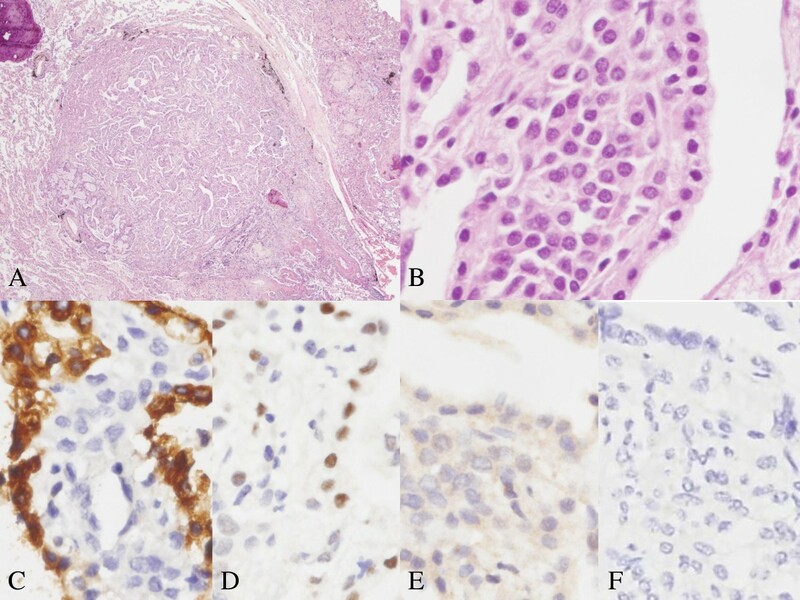 Multiple studies report cases about PSH with unconventional histological morphologies: PSH presenting in multiple nodules of atypical adenomatous hyperplasia, PSH containing adenocarcinoma-like portion, coexistence of PSH with primary adenocarcinoma, and PSH with metastatic hereditary non-polyposis colorectal cancer[3–6]. However, there has never been a publication about multiple typical carcinoids found simultaneously with sclerosing hemangiomas within the same lobe of the lung. This study reports a first case of multiple peripheral typical carcinoids associated with sclerosing hemangiomas within the same lobe of the right lung. A 52-year-old man with 2 years history of right lung lesion, which was incidentally detected on a chest X-ray, visited our hospital for further investigation and follow up. Patient had a past history of 40 pack years of cigarette smoking, frequent alcohol drinking, and pulmonary tuberculosis as a child. Patient was asymptomatic and there were no abnormal findings on physical examination, laboratory investigation and pulmonary function test. Chest computed tomography (CT) of the lung showed diffuse reticulonodular densities, tiny calcified nodules, and several larger confluent nodules in the right middle and lower lobes (Figure 1). These findings were equivalent to previous results from 2 years ago. Tuberculosis culture of the sputum and the bronchial aspiration fluids were performed, but there was no organism growth observed and both were negative for TB-PCR. Stable miliary tuberculosis was the initial clinical impression for this case. However, since possibility of malignancy could not be excluded, video-associated right lower lobe lobectomy was performed for a definitive diagnosis. Preoperative chest computed tomography. (A, B) CT shows numerous nodules with some calcifications in the right middle and lower lobes. Gross examination of the right lower lobe showed multiple well-circumscribed gray-red and white nodules inside the lung parenchyma, interlobar fissure, and also on the visceral pleura (Figure 2). These nodules were not encapsulated and were variable in size ranging in diameter from 5 mm to 26 mm. The largest nodule of these was located inside the lung parenchyma, measuring 26 × 20 mm in size. Postoperative macroscopic examination of the lung. On gross examination, the tumors were white to pink in color, variable in size, with some calcifications and hemorrhages. They were well circumscribed round shaped tumors without fibrous capsule. The arrows indicate carcinoid tumors. Microscopically, nodules were comprised of monotonous small ovoid to spindle cells with “salt-and pepper” chromatin pattern without necrosis and mitosis (Figure 3A-B). The tumor cells were positive for pancytokeratin (CK) and strongly positive for neuroendocrine markers; CD56 (Figure 3C), synaptophysin (Syn) (Figure 3D) and chromogranin (CG) (Figure 3E), but were negative for thyroid transcription factor-1 (TTF-1) (Figure 3F). 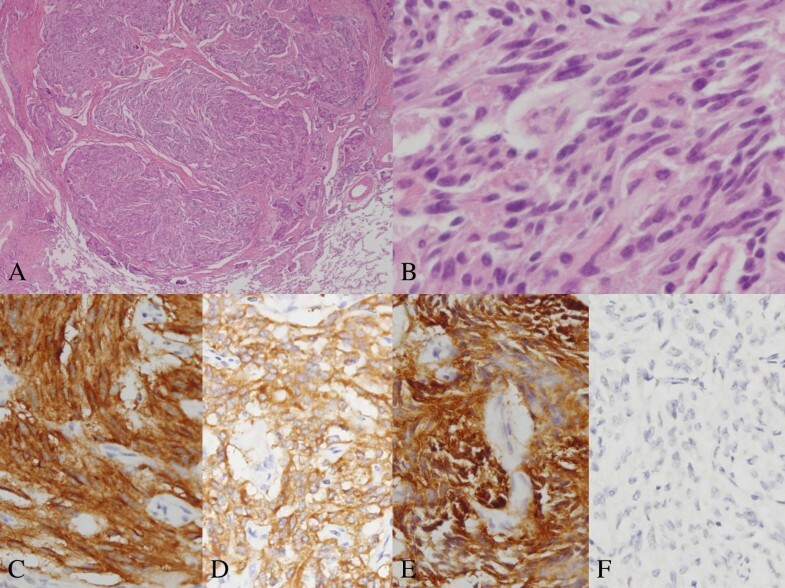 These demonstrate typical morphologic features of carcinoid tumor (Figure 3A-F). There were no proliferating pulmonary neuroendocrine cells confined within the bronchial and bronchiolar epithelium, which indicates that there was no evidence of diffuse idiopathic pulmonary neuroendocrine cell hyperplasia (DIPNECH). The other nodules in the lung parenchyma showed two different histologic types. Some nodules showed solid and sclerotic patterns composed of surface cuboidal cells and sheets of round cells forming small tubule like architectures (Figure 4A-B). The surface cuboidal cells had mild nuclear atypia with vacuolated foamy cytoplasm. The round cells showed uniform medium-sized polygonal nuclei with slightly pale eosinophilic or clear cytoplasm. Other nodules showed papillary structures which were composed of hyalinized stalks lined by surface cuboidal cells. Necrosis or mitotic figures were not observed (Figure 4B). On immunohistochemical staining, the surface cuboidal cells were positive for CK, epithelial membrane antigen (EMA), and TTF-1, but the round cells were positive for EMA, TTF-1 and negative for CK (Figure 4C-D). Both types of cells were negative for these neuroendocrine markers: Syn (Figure 4E), CG (Figure 4F) and CD56. This morphology represents classical features of PSH (Figure 4A-F). The distribution pattern of these nodules was random and the carcinoid tumors and PSHs were completely separate from each other. Generally, the nodules of carcinoid tumors were larger than the nodules of the PSH. Other pulmonary parenchymal diseases were not seen. Postoperative microscopical findings of lesion in the carcinoid portion. (A) The tumor showed trabecular arrangement. (B) The tumor composed of monotonous small ovoid to spindle cells with “salt-and pepper” chromatin pattern without mitosis. The tumor cells were positive for CD56 (C), synaptophysin (D), chromogranin (E), but negative for TTF-1 (F). (A. Original magnification of H&E staining at 20 X; B. Original magnification of H&E staining at 400 X; C-F. Original magnification of immunohistochemical staining at 200 X). Postoperative microscopical findings of lesion in the PSH portion. (A, B) The tumor shows papillary structures which are composed of hyalinized stalks lined with surface cuboidal cells which shows mild atypical nuclei with vacuolated and foamy cytoplasm. The sclerosing lesion contained round cells with uniform nuclei with pale, eosinophilic or clear cytoplasm. (C) On immunohistochemical stain, surface cuboidal cells were positive for pancytokeratin but round cells were negative for it. Both surface cuboidal cells and round cells were positive for TTF-1 (D) and negative for synaptophysin (E) and chromogranin (F). (A. Original magnification of H&E staining at 20 X; B. Original magnification of H&E staining at 400 X; C-F. Original magnification of immunohistochemical staining at 400 X). 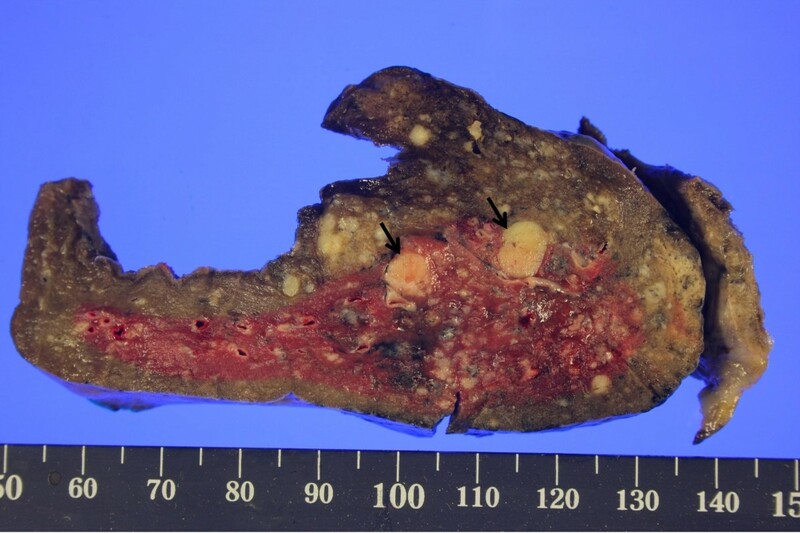 Integrating all the findings from above, the pathological diagnosis of this case was made as multiple peripheral typical carcinoid tumors associated with sclerosing hemangiomas in the lung. The patient did not receive any further treatments post-operation. The size of the residual nodules in the right middle lobe remains unchanged and no new lesion or recurrence has been detected for past 3 years of follow-up period. Carcinoid tumor is a malignant neuroendocrine neoplasm that rarely presents in the lungs. Such rare pulmonary carcinoids presenting as multiple carcinoids in a lung is an extremely unusual case. Pulmonary carcinoid tumor cells are believed to originate from Kulchistsky cells, located in the bronchial epithelial layer. Multiple carcinoid tumors are thought to be associated with diffuse neuroendocrine cell hyperplasia or carcinoid tumorlets that may cause small airway obstruction. However, there are also some cases that report about multiple peripheral carcinoid tumors or tumorlets without underlying neuroendocrine cell hyperplasia. In this patient’s specimen, there were no findings of diffuse neuroendocrine cell hyperplasia or carcinoid tumorlets. These findings suggest that the neuroendocrine cell hyperplasia is not an obligate preneoplastic lesion of multiple carcinoids. The underlying mechanism of multiple tumors developing synchronously in the lung remains uncertain. One study reports a case about multiple carcinoid tumors or tumorlets in the lung. Patients in this study had a past history of various malignancies such as breast cancer, endometrial adenocarcinoma, colon adenocarcinoma, thyroid papillary carcinoma and malignant melanoma. Primary carcinoid tumors found in combination with different types of tumors in other organs, such as in kidney or colon, have been reported in several studies[10–13]. However, a case about carcinoid tumors found in combination with different types of tumor within a lung has never been reported. The prognoses of multiple carcinoid tumors are unpredictable. Kayser et al. describes that typical carcinoid tumors without lymph node metastasis show a good prognosis. In this case study, synchronous tumors found together with the carcinoid tumors were PSH. Majority of PSH occur as solitary lesion[15–17]. Occasionally they can present as multiple lesions and several studies have reported such cases[18–23]. One paper describes a case of unilateral multiple PSH, where large nodules measuring up to 3 cm surrounded with small nodules measuring from less than 1 cm up to 2.5 cm were observed. Moreover, few cases of bilateral PSH have been reported[20–23]. All of these unilateral and bilateral multiple PSH cases had no events of recurrence or changes throughout the follow up period of 15 months to 9 years post-surgery. Although PSH is usually considered as benign, several literatures report about metastasizing PSH[3, 24–29]. They describe about metastasis involving single, regional or mediastinal lymph nodes. Distant metastasis from the PSH has not yet been reported but a case of local recurrence of PSH from the previous wedge-resection site 10 years post-surgery has been reported. Clinical behaviors of multiple PSH, whether the tumors have developed multicentrically or have metastasized from the primary tumor, remain unknown. Cases of PSH coexisting with other tumors or diseases have been reported in other papers. These include PSH presenting in combination with: atypical alveolar hyperplasia (AAH), alveolar adenoma, primary pulmonary adenocarcinoma, metastatic hereditary non-polyposis colorectal cancer, and primary adenocarcinoma within the same lobe of the lung[3–6, 31]. The authors hypothesized that the AAH or adenocarcinoma-like lesion may be a precursor lesion leading to PSH. There have been two cases, where a carcinoid tumorlet was found within the PSH. Additional two cases report about multiple carcinoid tumorlets ranging in size from 1 mm up to 2.5 mm found adjacent to PSH[16, 18]. In this current study, multiple PSHs combined with considerably larger carcinoid tumors, sizes ranging from 5 mm up to 26 mm were found. These two types of tumors presented as separate lesions and the distribution pattern was random. The underlying relationship between the PSH and co-existing disease remains uncertain. It is difficult to clarify the characteristics of PSH due to its rarity and various biological behaviors. Some studies describe that the round cells and the surface cells in PSH express different immunoreactivity. Both the round cells and the surface cells are positive for TTF-1 and EMA. The surface cells are positive for CK and negative for ER, PR, and Syp while the round cells are negative for CK and can be positive for ER, PR, and Syp. In this current study, the round cells of the PSH showed immuno-positivity for TTF-1 and were negative for Syp. Literature suggests that the positivity of TTF-1 and Syp indicates cells originating from the primitive respiratory cells. Syp is usually positive in neuroendocrine tumors such as in carcinoid tumors. Thus, the author suggests hypothesis that the presence of Syp in the PSH may be involved in the development of typical carcinoid arising from the PSH. There are few reports about PSH presenting as a single lesion with adjacent carcinoid tumorlets. However, a case of multiple carcinoid tumors presenting together with multiple PSHs have never been reported in the literature. This paper is the first case report of multiple typical carcinoid tumors associated with multiple sclerosing hemangiomas of the lung. YK participated in the design of the study, the sequence alignment, and drafted the manuscript. BJK assisted in drafting the manuscript. IJO and SYS made contributions to acquisition of clinical data. JHN and CSP made contributions for analysing the histological features of this case by H&E staining and immunohistochemical staining. YDC revised manuscript critically for important intellectual content. All authors read and approved the final manuscript.